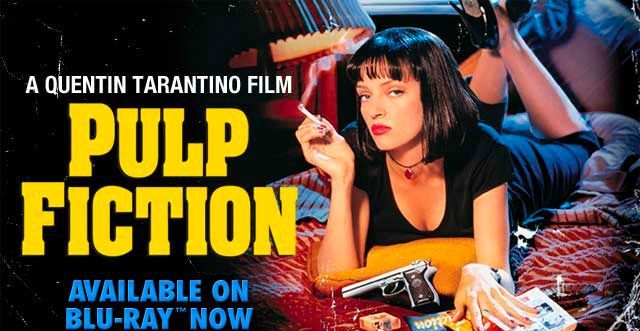 The 1994 Palme D’Or recipient for best film at the Cannes Film Festival, and the Academy Award winner for best original screenplay, Quentin Tarantino’s Pulp Fiction is a favorite amongst filmgoers young and old. The movie follows the lives of two mobster hit men, Jules Winnfield and Vincent Vega; a boxer on the run, Butch Coolidge; a gang leader’s wife, Mia Wallace; a pair of robbers, Yolanda and Ringo; and the gangster that connects them all, Marcellus Wallace. The script, written by Tarantino and Roger Avary, is divided into three sections: Vincent Vega and Marcellus Wallace’s Wife, The Gold Watch, and The Bonnie Situation. Taking inspiration from the gritty “pulp” crime novels of the thirties and forties, the non-linear time sequence is filled with popular culture references, witty dialogue, violence, humor, and even religion, keeping audiences on the edge of their seats for the film’s entirety. The purpose of this website is to examine the religious aspects of this seemingly non-religious film. Many critics argue that the world of Pulp Fiction is nihilistic and capitalistic, replacing religious meaning with elements of pop culture. Vincent Vega and Marcellus Wallace are unable to escape the temptations of the money and violence filled world they live in and ultimately fall victim to consumerism. However, several of the film’s characters are able to transcend nihilism and follow God’s path to righteousness and are redeemed at the end of the film. Although pop culture references are littered throughout Pulp Fiction, at its center the movie is a religious narrative illustrating the triumphs of good over evil, divine intervention, and the redeeming power of God. Created by Jordan Steinhauer for Dr. Jennifer Porter's Religion 2812 class at Memorial University. *sources for all media can be found be clicking the picture or video.